Let me first be clear: if you're expecting to read about the LA 'miracle weight loss/health kick' du jour of juice *cleansing*, turn back now for you will be thoroughly disappointed. I love food too much to give it up for any amount of time. I don't see the point of extending life if you're not going to spend the time you have living and enjoying it (as long as, of course, you're not indulging to such excess that you're making yourself sick). So when this juice cleanse craze literally took over LA, I didn't really pay a lot of attention to it at first. Then I realized that this could be perfect for people who don't enjoy eating vegetables, and/or wouldn't care to spend the time to prep and cook them, to - as Pressed Juicery neatly captures it on their chalkboards - "drink your veggies". Not as meal replacement, but as dietary supplement. Like taking vitamins, but in fresh, liquid form vs. hard to swallow processed pills. I don't remember how I landed on Pressed Juicery as the one to try first - but I am SO glad I did. "Greens 2" and "Greens 3" became my favorite juices of all time, *despite* containing kale, spinach, romaine, parsley, cucumber, celery, with apple and lemon (and ginger as the only difference with Greens 3). I fell in love with them not only for the reasons above, but ALSO BECAUSE THEY TASTE SO DAMN GOOD. I didn't fully realize how sugary national brand bottled juices (and smoothie bar blends) are, until I tasted these juices. It's like store bought juices are sticky going down because they are so full of sugar - and often way too thick to go down comfortably (you ever feel the need to have a 'chaser' of water after drinking a juice / smoothie? Then you know exactly what I mean). Pressed Juicery juices are not organic, but they are raw and cold pressed, and I love their relative clarity and levity. It actually *feels* healthy but also *tastes* delicious. 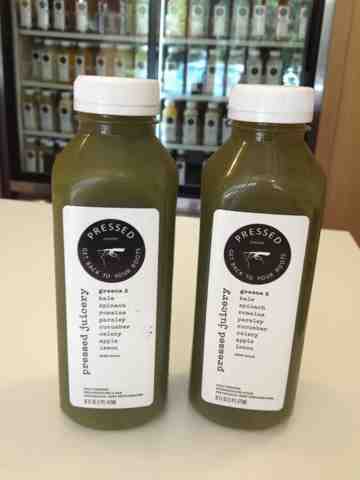 One thing Pressed Juicery does to help customers out (and keep 'em coming back) that I love is their loyalty program. Just provide your phone number every time you make a purchase - and with every 10 visits, you'll get a full-sized bottle of juice of your choice for free! Select locations will also run specials: I love the stall at the complex next to Brentwood Country Mart - perhaps because it's semi-hidden in the inner courtyard, they have started running Happy Hour daily from 6pm-8pm offering 15% off any juice purchase! (This stacks with the loyalty program - HH visits still count towards your 10; you just can't redeem your freebie during HH but can do so at any other time or location). Such a great deal compared to other juice vendors, and it's on my way home so I make sure to stop by whenever I can get off work on time. With all the travel I've been doing for work, I really wish Pressed Juicery would open up a stall at LAX - they would make a killing with weary travelers not allowed to bring their own favorite drinks past security, and who would be so grateful for that one last immune system booster before heading into lockdown with cabins full of germ-spreading passengers. I know I would make a mandatory stop by their stall EVERY time I travel. 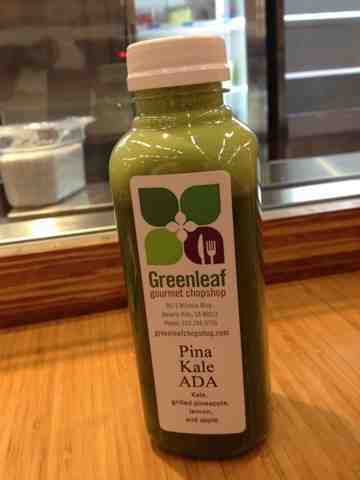 Another great place for delicious juice - is Greenleaf Gourmet Chopshop. Unlike Pressed Juicery, which is grab-and-go pre-packaged (though done daily) bottles - Greenleaf Chopshop is more of a true juice bar, with drinks made to order as part of a dining experience (though you can order juices bottled to go). I'd previously only experienced Greenleaf through tasting their incredible salad dressings at Artisanal LA. 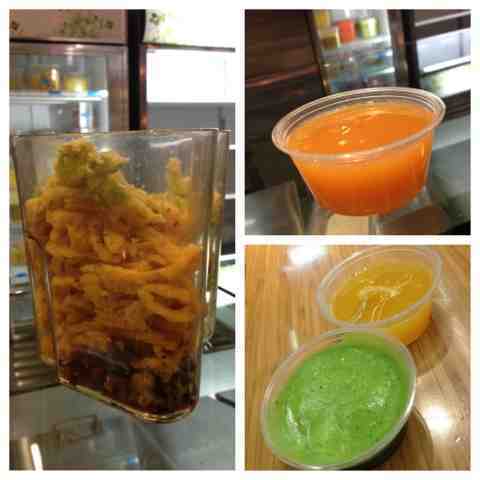 But recently, I was invited to a tasting of their new juice offerings at the Century City location. Chef Kristi was clearly passionate about bringing healthy AND delicious alternatives to her guests - and makes it all fun with a fantastic, entertaining personality. I felt like we were hanging out the entire time with a cool and highly skilled bartender, except that what she was serving up is actually good for your body, not just for your sanity. In fact a few of the juices on the menu seem inspired by craft cocktails: such as the Sangria-licious, and my fav of the night: Pina-Kale-Ada ($7.25) made with kale, pineapple, lemon and apple. The pineapple is grilled first before juicing to bring out the sweetness, which also adds a nice subtle smokey flavor that gives the drink more dimension! Another fav which doesn't have a cocktail inspired name but definitely has a cocktail inspired heart: Hawaiian Kick with pineapple, grapefruit, orange and jalapeno - love the bit of heat! Purists can get single flavor juices like Carrot or Tomato ($5.95), or Orange, Grapefruit, Green Apple, Red Grape ($6.95). But as I mentioned, I prefer mixes like Pina-Kale-Ada for value and time saving reasons. The only drawback of Greenleaf for those who don't live or work in the immediate area, is that they close at 4pm. So I'll have to stop by during lunch some day; speaking of which, Greenleaf also offers some great menu items that to be honest I wouldn't have thought to stop for, as I'm about taste first and healthy as a secondary, side benefit that I'll take if it's there, and not care if it's not - but now will for sure. 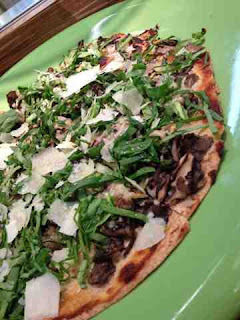 Like when we tasted the Wild Mushroom and White Truffle Oil Thin Crust Tortilla Pizza with goat cheese, baby arugula and shaved pecorino - it didn't even register that it was baked on a custom formulated tortilla that makes the whole pizza under 400 calories - I only knew that it tasted delicious!!!! *Disclaimer: tasting at Greenleaf Gourmet Chopshop was hosted. Anyways, to get back to juice: I've pretty much cut out soda from my daily routine (ok, I'll cheat once in a while, who doesn't?) and replaced them with juice. No crash cleanses as I love food too much, and won't last a few hours just juicing. But I actually feel like I have more energy on the days that I'm drinking these versus any other beverage. So before you dismiss juicing as another fad like I nearly did - give Pressed Juicery and/or Greenleaf Gourmet Chopshop a shot...as a tasty fresh alternative to sugar-loaded processed drinks. You won't regret it! 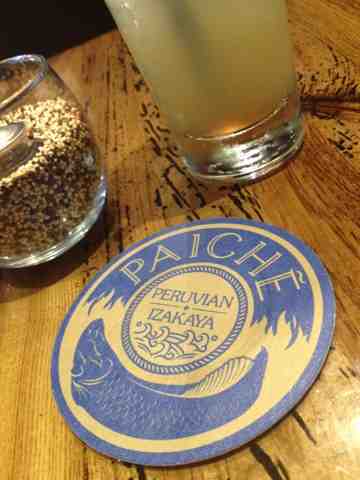 Paiche Peruvian Izakaya and Prehistoric Amazonian Fish Ribs! They had me at Peruvian Izakaya. When Chef Ricardo Zarate and partner Stephane Bombet announced that they would be opening their third restaurant, the 2011 FOOD & WINE Best New Chef's follow up to Picca and Mo-chica - the concept sounded so intriguing that I immediately put it on my To Do list. Paiche is a modern take on Peruvian meets Japanese izakaya-style cuisine, a gathering place for small plates to go with drinks - and featuring a prehistoric species of Amazonian fish that also serves as the restaurant's name. It was to be off-the-foodie-map geographically though, over in Marina del Rey - a lovely neighborhood on the water, to be sure, and very on theme for a seafood centric restaurant - but not the first to come to mind as a dining destination. But that Paiche had decided on this location is an exciting development, that hopefully will inspire a trend of more 'adventurous' food options in the area. 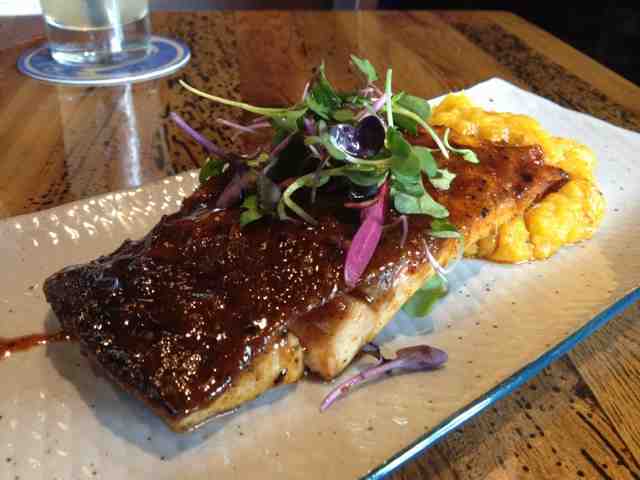 The restaurant is on the ground floor of a modern, chic apartment complex, across from DSW at Marina Marketplace. The decor is appropriately oceanic, blues and wood panels in an airy space - complete with tank of live seafood and the open kitchen running most of the length of one roughly wave-shaped wall. 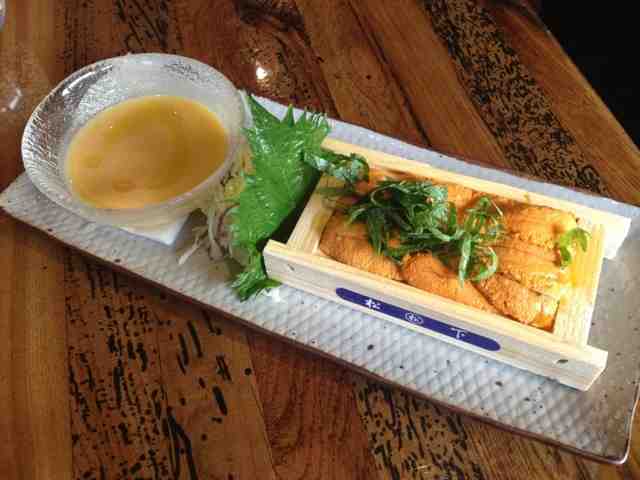 So first up of course: Uni Shrimp Toast ($14) sea urchin / shrimp paste toast / rocoto honey sauce. This one actually made me think of a mashup more of Japanese and Italian than Peruvian - it was like a hybrid of sushi and bruschetta. With the Peruvian element coming through perhaps just in the South American chile peppers used in the sauce. Triangles of toasts were topped by shrimp paste, finely chopped tomatoes, then rice, sea urchin and a chile pepper (yep, that's what rocoto is, I had to Google it too) honey sauce. I am a huge worshipper fan of sea urchin - and really wanted to love this - but the jumble of bold flavors between heat, sweet, tart, and varying textures of the other ingredients to me ended up slightly overwhelming the uniquely funky flavors and natural lusciousness of the uni - you kind of spend the whole time trying to process what you're tasting versus purely enjoying it. 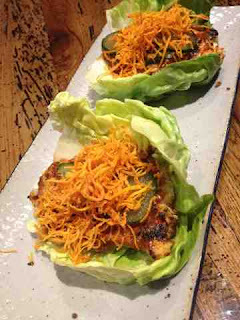 When I asked him what items I should not leave without trying, the first thing my server highly recommended was the Paiche Lettuce Wrap ($12) grilled amazonian fish / anticucho miso marinated - and he did not steer me wrong - I LOVED the perfectly balanced sweet umami smokiness of the grilled Amazonian fish, and its tenderness against the refreshing juicy crunch of lettuce, topped by crispy sweet potato wisps. The sauce was particularly addictive - this is one to eat with your hands, and I definitely licked my fingers clean. 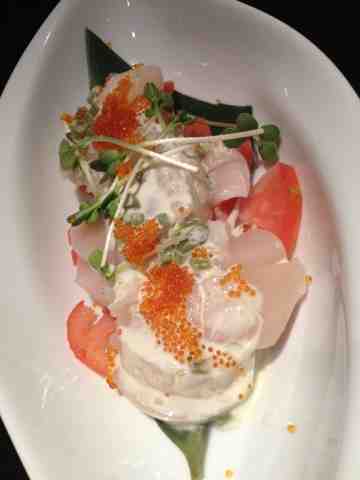 Easily one of my favorites of the dishes I tried. As I also love quail, and liked that my pisco cocktail could possibly go well with food that was also prepared with the liquor: I tried the Grilled Quail ($16) pisco basted / ume plum wine dressing. 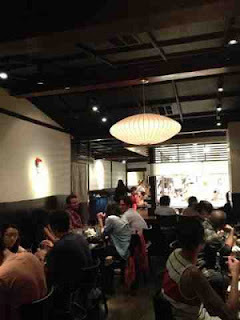 While I loved the flavors in the again boldly flavored sauce (this is not a place for culinary wallflowers, for sure!) 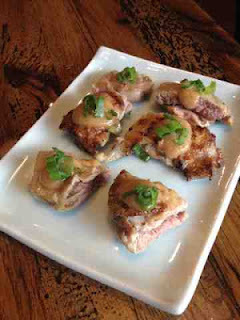 - for the price, I would have liked the pieces of quail to be more consistently grilled, for more distinct contrast between deliciously smokey crisped 'skin' with tender juicy interior on every piece. My other absolute favorite of the meal, all the more because I wasn't sure what to expect at first from the description on the menu was Pacu Ribs ($12) amazonian fish ribs / anticucho lime miso / zapallo puree. They arrived looking like pork ribs at least from the top, due to the BBQ-sauce-colored rocoto teriyaki glaze. But on closer inspection they were actual ribs from a fish - apparently that is cousin to the piranha! - that had the most amazing combination of the unbelievable tender flakiness of a Cantonese-style steamed fish, and the hefty feeling of meat ribs smothered in deliciously sticky sauce. On the side was another South American specialty: zapallo or squash puree (yep, had to look that one up too) whose milder flavor and creamy texture perfectly complemented the fish. When I first saw Uni Ceviche on the menu, I wasn't sure if I wanted to spend $25 on what would essentially amount to sashimi, but decided last minute that I wanted that to be my last savory taste (especially when my server confirmed that it would be like a 'tray of sea urchin' - I figured chefs would of course have access to much better quality uni - and the Peruvian twist is in the aji amarillo lemon vinaigrette that would come with it). It was delicious, but I have to admit that in terms of presentation the wooden tray kind of reminded me of how uni is sold at Nijiya market, and that while I liked the aji amarillo sauce on its own, I found it to be too bold as to overwhelm the delicate flavors of the uni. I ended up eating most of the tray on its own, without the sauce - but of course I will never be one to complain about any amount of good uni. For the sweet finish: Chicha Raspadilla ($9) looked the most intriguing from the menu -the lack of description added to its mystique. It turned out to be like a shaved ice topped with blue corn juice (delicious, I loved the drink version at Picca as well - like a much less sugary, less dense grape juice), accompanied by cubes of pineapple and apple, topped by a citrus sorbet. 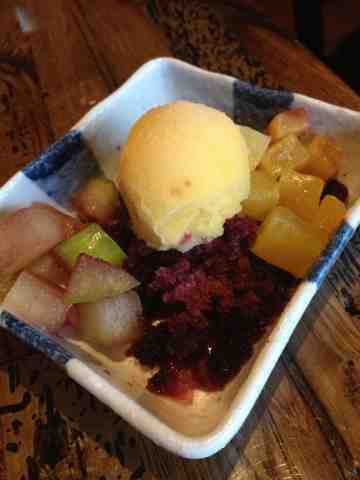 Loved the shaved ice but wish they had used more exotic fruits. All in all, a great experience especially for Marina del Rey (though a bit pricey relative maybe not to the area, but to small plates spots in other areas of LA). Paiche really shone with the dishes that had the most unique ingredient - featuring the namesake fish. Was sad that I didn't realize until the time of this post that Paiche offers a happy hour with 20% off daily (see deal alert below) - so definitely need to go back soon! I've never been a big udon fan - I prefer by far the much richer, pork-packed broth and sleeker noodles of tonkotsu ramen. 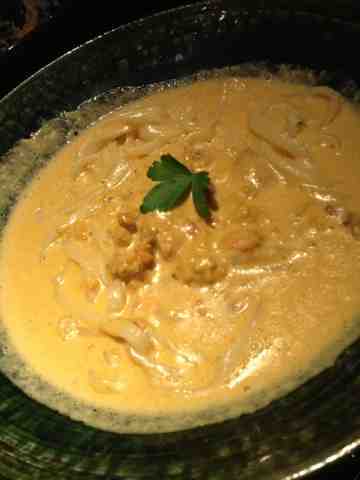 But I worship the ocean surfaces that uni 'walk' on, and when I heard that Marugame Monzo serves a sea urchin cream udon - I knew I had to check it out asap. 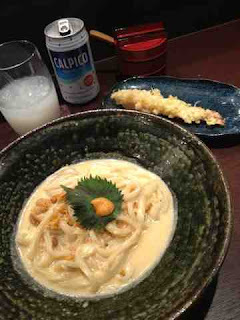 What I didn't realize (because whenever uni is mentioned, a tidal wave of happiness washes over me and all I basically end up hearing is..."blah, blah, blah...UNI...yada yada...") was that the udon is actually handcrafted, made to order. 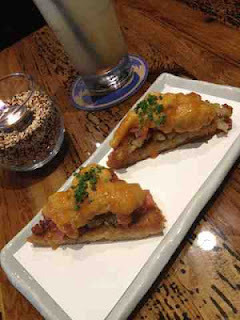 On a random weeknight, in celebration of Gourmetpigs ace-ing her PhD defense (congrats!) - I met up with the newly minted Dr Pigs and Wanderingchopstick in the latest hotspot to hit Little Tokyo. 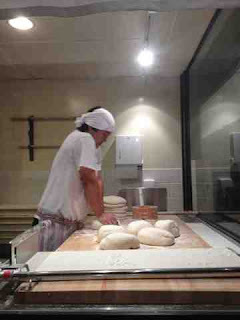 A cozy place with just a handful of tables, just down the row from Daikokuya, Marugame Monzo also offers counter seating in full view of the open kitchen, where you can watch the master chef at work painstakingly pulling those beautiful udon noodles together for each order. So, the noodles are obviously The Big Deal here, but they have a pretty good selection of other small plates as well - one that caught my eye was the Scallop Carpaccio - amazingly fresh, plump, supple scallops topped with tobiko roe, chopped green onion and a creamy sauce, all set on top of slices of momotaro tomatoes. Delicious - and something I would definitely order again on my next visit. Because anticipation makes the payoff even better, I made myself wait for the uni udon and check out another unusual sounding bowl: Mentai Squid Butter udon ($12.95). This ended up being a lightly sauced udon noodle dish with addictively tasty tiny briny orbs of squid roe and super tender slices of squid dressing up fresh made udon noodles. The difference in texture and taste of these noodles is like the undeniable difference between fresh made and 'shelf-stable' pasta - once you go fresh it's hard to ever go back. Count me an udon fan now - of the Marugame Monzo kind anyway! Then at last, the main attraction: Sea Urchin Cream Udon ($15.95). Let's just first state that as three massive uni fans, we initially ordered 2 bowls to share (as we saw that the bowls were giant, and we'd already also had 2 more dishes) - but after a few bites of this eyes-rolled-back-foodgasmic uni udon I immediately had to order a third. The third bowl was even better - not sure if it was because it was just before closing time, we managed to slide the order in for last call, and presumably they were generous with depleting their day's supply since it doesn't keep well - but this last bowl had several times the intensity of uni than the other two. It blazed a deeper brilliant orange, visibly crowned with larger pieces of the beloved creature of the sea. We died several times over and questioned whether we cared enough about social decorum not to lick the bowls clean. Though any self respecting food lover MUST NOT LEAVE without getting the uni udon, they do also have other interesting fusion varieties from Miso Carbonara to Porcini to Vongole - will have to try these next time I'm back, if I can bear to take up any amount of precious stomach space for anything other than that insane proof of divine design that is the Sea Urchin Cream Udon. 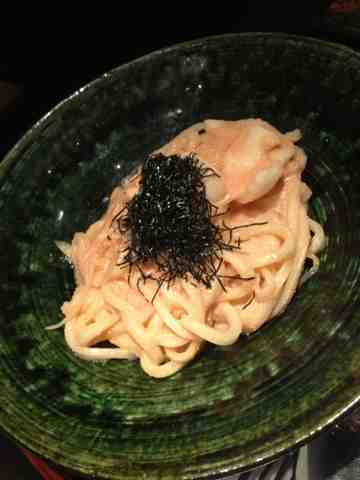 Update: 6/8/13: went back for lunch & uni udon is not on that menu, but you can still order it. Though, the one I had at lunch was decorated by a shiso leaf, the sauce was watery, uni kind of dry, and generally not as good as what we had at dinner. Also got a side of tempura shrimp ($2) which was pretty flavorless - with limp shrimp that didn't taste very fresh, so would not recommend that side. Was nice walking off lunch at the ever entertaining Japanese Village Plaza though - but guess I will stick to dinner when it comes to uni udon!